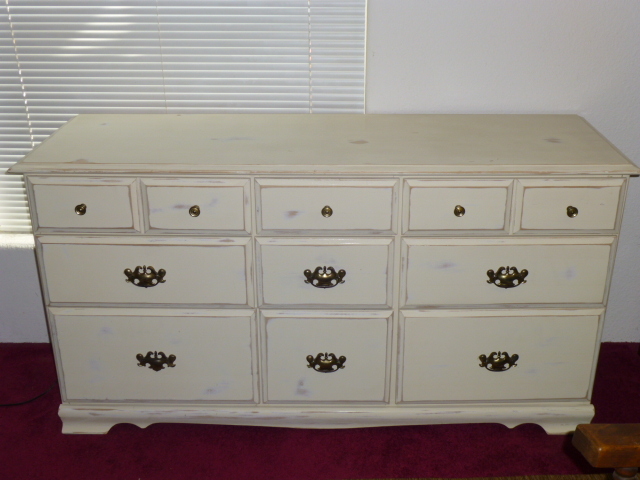 Here’s the chest of drawers that Michael rescued from the curb a while back. Wasn’t able to get a before picture. Sorry. It was only a little scratched up, so they really wouldn’t have shown up in photos anyhow. A few knobs missing, one pull was missing the handle part and several of the drawer runners were missing or broken off. 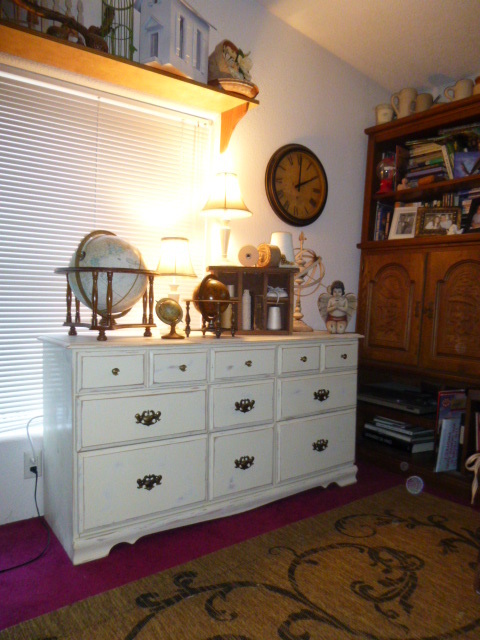 Everything else in the living room is so DARK, that I decided to leave this piece the ivory color it was. But it was a glossy finish which I don’t like AND which shows every little scratch. 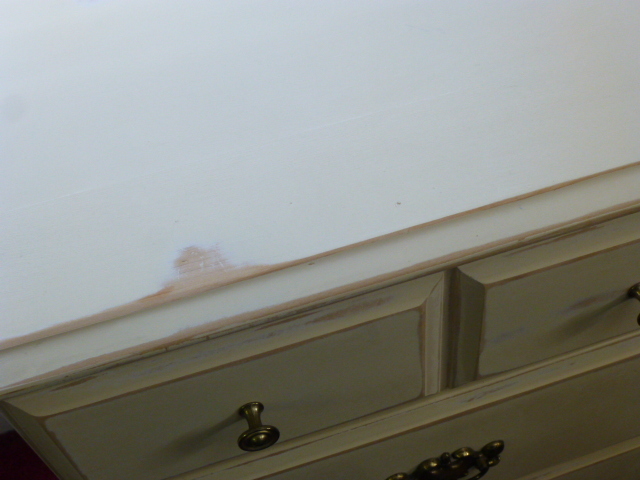 So I sanded off all the gloss and sanded the edges a bit more to get down to the bare wood for a distressed look. I MIGHT go back over the sanded parts with some dark glaze later on, but I was working with a time limit (impending rain storm!) and wanted to get it ready as quickly as possible. I was able to glue the broken runners back in place. Michael used his nail gun to reattach the one plastic guide that had broken off. 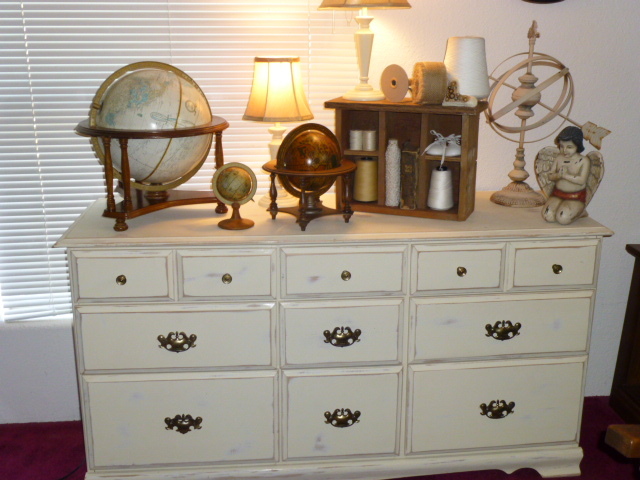 A couple of the drawers are still missing the runners, but they work fine without them. Just have to be careful to not open the drawers too far of the will come ALL the way out! The drawer ‘innards’ were VERY clean. I decided to line them with some pre-pasted wall paper (from the thrift store of course!) 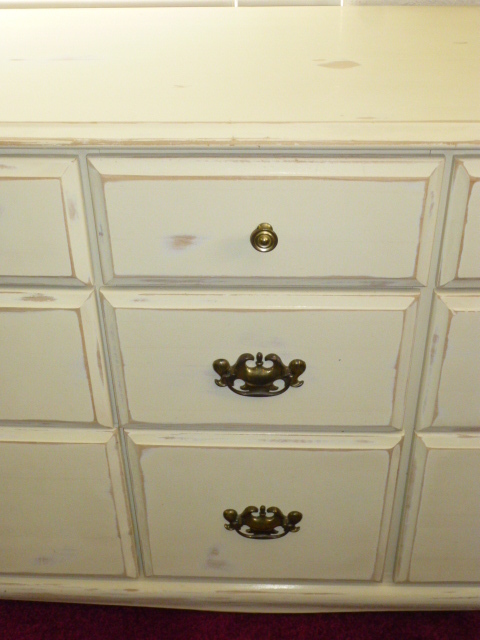 because for now I am using it to store craft supplies and I don’t want to ‘mess up’ the nice drawers. The one pull that was missing a handle, I could not find a match for at all. 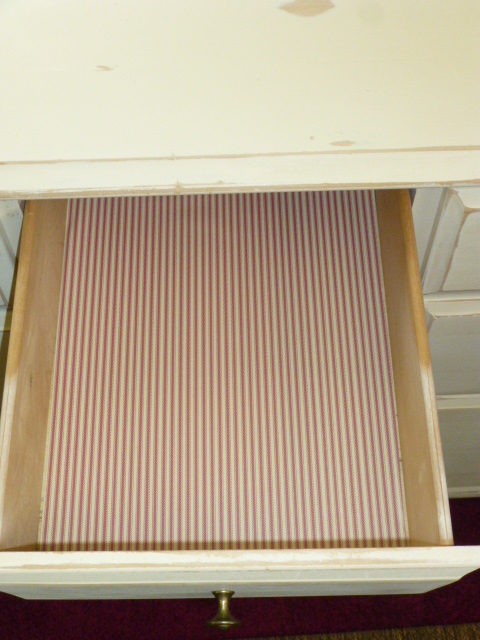 And I didn’t have six other matching pulls that fit the existing holes. But I did have one spare and similar drawer pull that had the same size PULL as the one that was missing. Michael was able to just bend it a bit and yank it out and fit it into the one that fit the dresser! 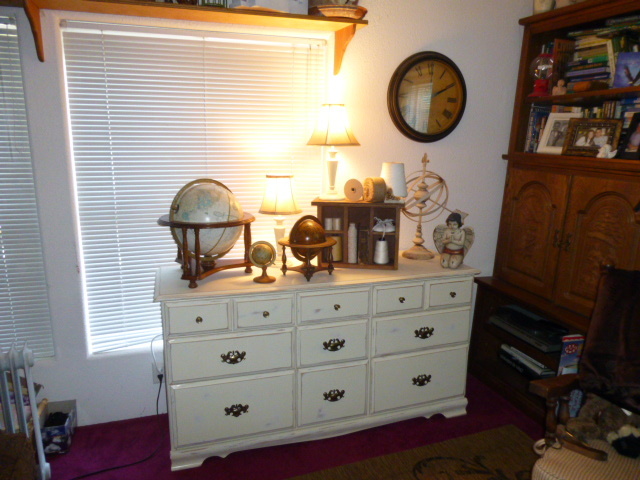 So we didn’t have ANY ‘out of pocket’ costs for this credenza for the living room! And of course I had to ‘style’ the top of it right away! 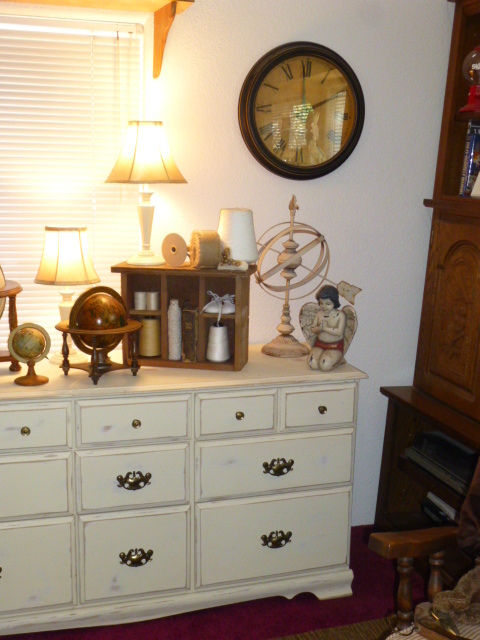 With the chest being so light colored and the rest of the furnishings so dark, I went with dark accessories to keep this from looking like a ‘white elephant in the room’. 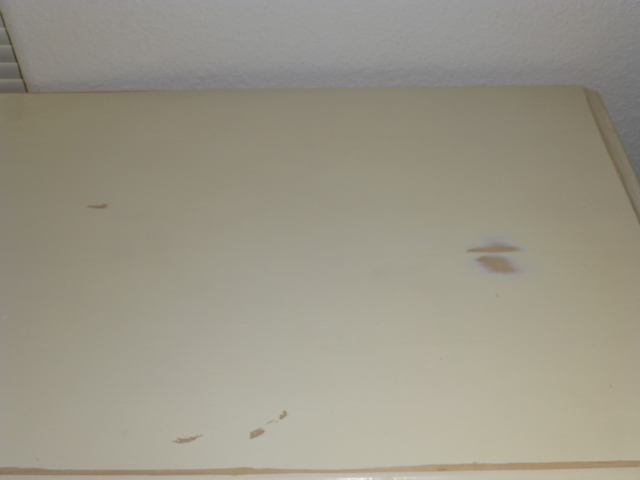 That little dark wood shelf is actually a very primitive old drawer that Michael brought home a while ago. I had planned to eventually take it to Stars; but it works so well here I think I’ll keep it. The rest of the accessories were just pulled from the room. 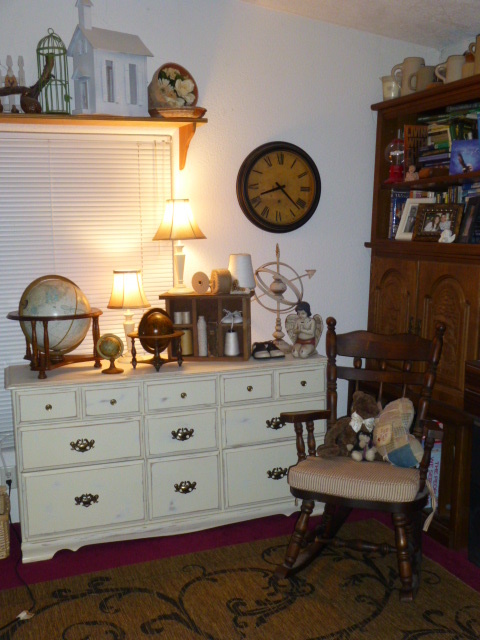 Mostly from thinning down what I had on top of the entertainment center. In this picture you can see a bit of the new rug I got to put on top of the UUUUUUUUUUUUUUUUUUUUUUUGLY magenta wall to wall carpet that Michael refuses to get rid of! I’m sure that carpet WAS burgundy and very ‘in’ at one time. That time has passed. Seriously I’d rather have DIRT floors that this carpet! But Michael won’t budge. So I just cover up as much of it as I can. I was looking for a lighter color rug, but didn’t want to pay a fortune. This is actually an OUTDOOR area rug, kind of a ‘sisal’ feel to it. I’t darker than I’d have preferred, but for the price I’ll deal with it. And it does go well with the new recliners. That rocking chair is the first piece of furniture I ever built. It was a kit of course. But I was pretty proud that I got it assembled and stained by myself some 30+ years ago. I rocked my baby (he’s 30 now!) to sleep in that rocking chair! The rest of the living room coming soon! You did a wonderful job on the dresser! What a great storage piece! The OCD in me thinks that the “odd” pull should be placed on the middle drawer of the second row of drawers to make it more symmetrical or like it was originally made that way. I honestly cannot even TELL which is the ‘odd pull’ !?!?! I seriously had to go look, VERY closely to be sure! The one that LOOKS different in the photo is because the handle part was flipped UP. I would have had to BUY all new and matching pulls otherwise! I read too fast, so sorry. I now understand that the pulls are the same backing but you added a different ‘handle’. So disregard my OCD comment. lol You were very smart to figure out a way around buying new pulls. I cannot tell one of the pulls are different from rest! Looks GREAT as usual! 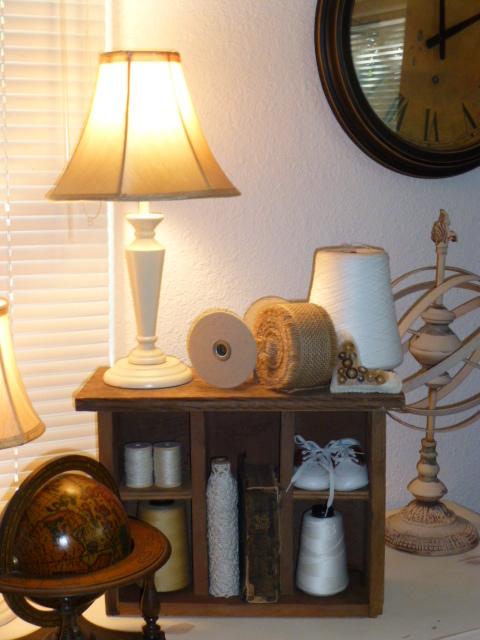 I love seeing what items you keep for your own house. It would be hard for me not to want to keep them all. Because everything always looks so good!